Unfortunately, the Anthelmin Plus is not available for sale anymore. Please have a look at our entire worm treatment range for alternatives. Anthelmin Plus is a wormer for puppies and adult dogs and is effective against several types of worm. For the treatment of roundworms (Toxocara canis, Toxascaris leonina), hookworms (Uncinaria stenocephala, Ancylostoma caninum) and tapeworms (Taenia spp., Dipylidium caninum) in adult dogs and puppies. Administer a single dose for adult dogs. You can repeat this every three months for prevention. With a severe worm infestation, it is advised to repeat the dose after 14 days. Puppies can be wormed from 2 weeks old with Anthelmin Plus. Afterwards, you can administer it every 2 weeks until the puppies are 12 weeks old. You can then treat the puppies monthly until they are 6 months old. You can also worm the mother dog 2 weeks after giving birth and then every 2 weeks until the end of the nursing period. The tablets can be administered directly into the mouth of your dog or via the food. 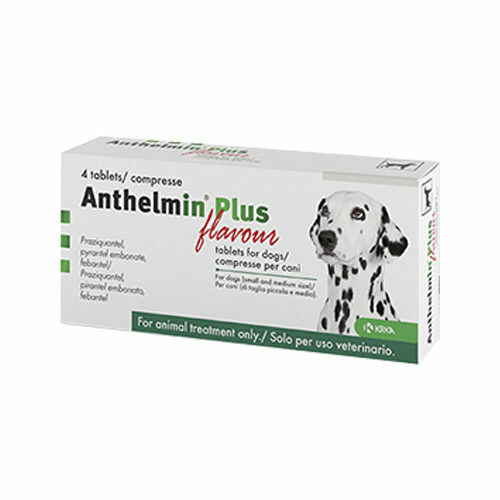 Anthelmin Plus for small to mid-sized dogs contains tablets that can be halved or quartered into equal portions. This way, you can provide a precise dosage for your dog. The Anthelmin Plus XL can be halved for the right dosage. In the first 2 trimesters of pregnancy. Have you used Anthelmin Plus before? Let us know what you think about this product.